wow! This is so gorgeous! Lovely! Tina! Tell your momma that she's the bomb dot come! Super sweet tunic. :) And of course you look amaze in it! Hope you're having a great Tuesday, girl. oh wow! thats a pretty tunic. Love the colors and the pattern. 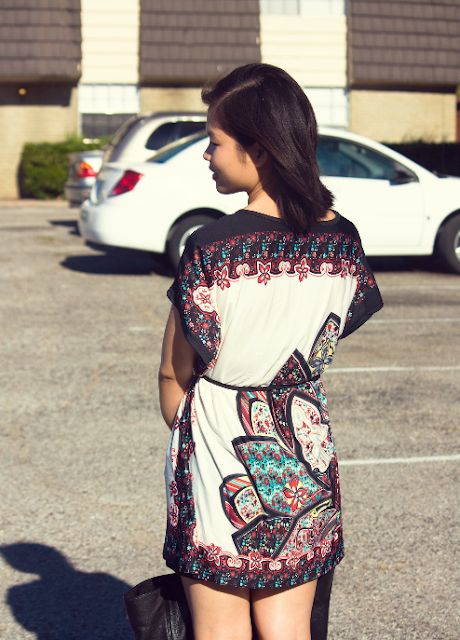 Absolutely gorgeous one-of-a-kind tunic! Your mom does amazing work! Great print! perfect for spring/summer! What a pretty dress your mom made! You realize thus considerably when it comes to this matter, made me personally believe it from so many varied angles. Its like women and men don’t seem to be involved until it is something to accomplish with Girl gaga! Your own stuffs outstanding. Always care for it up! Your blog is so awesome! Love it so much! You have a new follower here)) Hope you'll do the same, dear! Thank you so much for keep following my blog.Thanks for visiting my blog:) By the way! It is almost my first year anniversary for my blog and planning to make my own video. I am willing to answer any questions as possible from my readers. If you have any questions about me, my style, or anything. Feel free to ask! If you do have questions for me, please leave a comment and ask there, thank you so much for your time and def coming to your blog again! you have such a great blog and sense of style! it is a DIY???? amazing! so in love with it!!! i love the tunic and your shoes are gorgeous! p.s. i'm a new follower, love ur blog! Greatpost! Would you like to follow each other? amazing DIY! the final result is simply amazing!! :) would you like to follow each other on GFC and bloglovin?? :) let me know! have a great week! i love, love your shoes you are wearing! lovely blog!